To Sum It Up: Max Barker is a sumage, only able to absorb then redirect the quintessence that other mages use to cast spells. He’s also stuck in a bureaucratic job that’s going nowhere until Bryan “Biff” Frederiksen arrives at the DURPS office. Biff is the Beta werewolf to his younger brother Alec’s Alpha, and he’s been tasked with getting the newly relocated pack officially registered. Max and Biff form an instant connection, but the past that Max tries so hard to bury beneath copious amounts of sarcasm may stand between them. 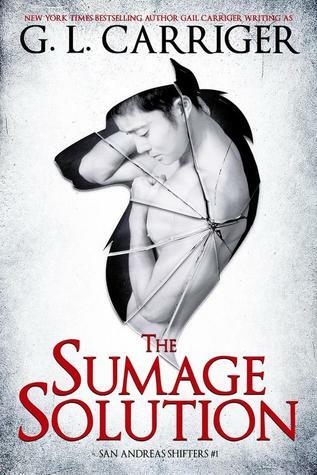 Review: Gail Carriger is a must-read author for me, so I was thrilled to have the opportunity to read The Sumage Solution. Writing as G.L. Carriger, the novel is a bit of a departure from the Victorian steampunk world of Carriger’s adult Parasol Protectorate and YA Finishing School series. The Sumage Solution is set in modern day San Francisco and is one smoking, scorching, smoldering paranormal romance. This might be the closest my Kindle Fire has ever come to, well, catching fire. The Sumage Solution features a variety of paranormal beings, some of which, like kelpies, kitsune, and mermen, I haven’t read about as much as one of the book’s main supernatural species, werewolves. What I love about Carriger’s take on the paranormal is that you never feel like you’re reading yet another book about werewolves, vampires, ghosts, etc. ; her characters are always unique and often endearingly quirky, and they completely draw you into their story and their world. Anyone who loves snarktastic characters, which I do, will love Max, the titular sumage and one of the novel’s two protagonists. Not only is Max a smartass, but he also doesn’t know when to shut up, and the resulting sass is hilarious. Beneath all of the razor-sharp sarcasm, though, Max tries to distance himself as much as possible from a horrible childhood growing up with a cruel father in whose eyes Max was nothing but a failure. Lacking a steady, supportive presence for most of his life, Max starts to panic when instant chemistry with werewolf Bryan (nickname: Biff) begins turning into something more serious. Biff is the Beta of a pack new to the San Francisco Bay Area, and his Beta instincts to calm and protect are exactly what Max needs. Biff is also a man/werewolf of few words, which works out perfectly for the relationship because Max is always running his mouth. While the romance definitely has some absolutely torrid moments, it’s also sweet; you’ll root for these two to be together and to overcome anything that drives them apart. Overall, this was a sizzling start to the San Andreas Shifters series. Gail Carriger has created another cast of highly entertaining characters, and I look forward to more of their stories. All in All: Gail Carriger continues to make the supernatural feel fresh with her new paranormal romance. And yes, there is tea involved! Oh wow, I didn't realize she is starting a new series! This one sounds like a lot of fun - I love snarktastic characters. So glad I read your review! This was great fun; I love the humor in all of her books, and there was plenty of it here!